A brutal journey set on a desolate frozen island. Praey for the Gods will launch for PC via Steam Early Access on January 31, followed by a full release on consoles and PC later in 2019, developer No Matter Studios. Note: Praey for the Gods has full in-game controller support aside from the launcher. Scale Massive Beasts – Overcome impossible odds to climb atop and defeat the massive beasts that are bound to this land. Climb, Glide, Swim – You can climb on virtually anything you can get your hands on, from ruins and mountains to the massive beasts that inhabit the land. Ascend to the tops of mountains and then glide over the open world to reach previously inaccessible locations. Swim in frigid water to uncover hidden locations that contain secrets and treasure, but don’t stay in too long or your swim could become your last. Explore, Craft, and Survive – You’ll arrive on a frozen island with only the clothes on your back — it’s up to you to survive. Make fires, hunt for food, and find the equipment you need to make it through an eternal winter. Nature isn’t the only danger, so craft weapons, defeat minions for better gear, and venture into long forgotten caves to discover their secrets. Triumphing over these trials will prepare you for the impossible odds that wait. 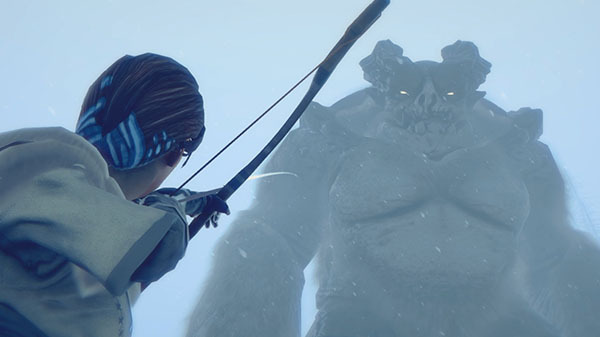 Make Your Path – Praey for the Gods is a non-linear game where you choose who you battle and how. The large beasts can be attempted in any order allowing you to set the course. Unravel the Mystery – Why won’t the winter stop? Why has no one returned? Cryptic paintings left behind allude to a story once thought forgotten. To restore balance and reclaim the land, you you will be faced with questions that not even the gods know the answer to. A Beautifully Frigid World – Explore a landscape of unending winter framed by snow-capped peaks and crawling fog. The remnants of an ancient civilization lie before you, but don’t let awe turn into carelessness — snow storms can crop up at any moment and bury you in a blizzard. Luckily, you can leave footprints in the snow and follow your footsteps back if you are lost. Watch the Early Access trailer below.